I’ll say this about Countdown, it was very fast paced. From the second the reader is dropped in to this dystopian future the plot is always barreling forward. It had my heart beating quickly and kept me flipping through the pages. The problem was that all this action didn’t allow for a lot of back story. Because this is a dystopian I expected a little more world building. This lack of world building left me confused. 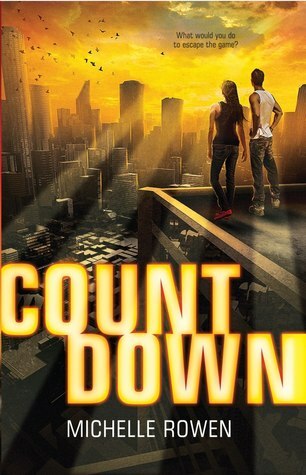 I had a lot of questions regarding how the Countdown operates, and why the world ended up as it did. I would have been okay with little world building had the characters been enough to keep me interested. Unfortunately, Kira and Rogan were really just tools for the action to happen through. To quote 10 Things I Hate About You “I know you can be overwhelmed, and you can be underwhelmed, but can you ever be just whelmed?” That is how I felt by the characters in Countdown. I didn’t love them, or hate them. I just thought they were alright. The other thing I wasn’t too keen on was the relationship that develops between Kira and Rogan. I wasn’t buying it. They meet each other for the first time when they wake up cuffed to one another. From there a series of challenges ensue that do bring them closer together but…I guess I was just never really feeling the loooooove. For all of Countdown’s faults I did end up enjoying this novel. It was fast paced, entertaining, and it kept me interested right up until the end. If you’re looking for the book equivalent of an action-thriller movie, then this is definitely something you would enjoy!